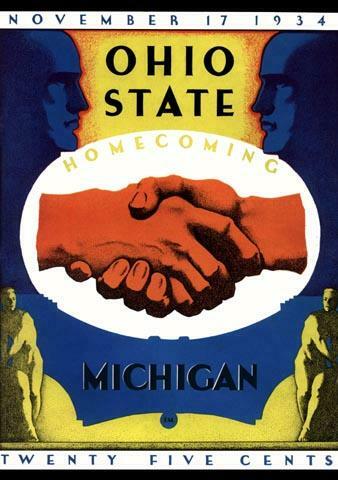 Whatever form of knockout powder the Buckeyes were putting in Michigan's water during the mid-1930's, they should have kept a few gallons in reserve for later use. From 1934 through 1937, the boys from Columbus handed the Wolverines a series of four consecutive spankings by a combined tally of 114 to 0! And that friendly handshake on the cover? Strictly for show. The straight razor was kept out of sight.